Māori believe the earth is the giver of all life – from the soil, rivers and sea comes food, and that food is again cooked by nature; either beneath the earth (hangi) or with geothermal energy. 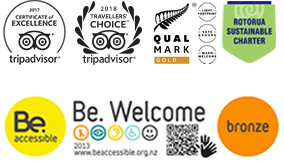 Here at Whakarewarewa – The Living Māori Village, food is a unique and quintessential part of what we offer our guests, just as it was when our ancestors welcomed visitors to the valley all those years ago. In Māori culture, the act of Manaakitanga, which loosely translates to hospitality, encompasses an expectation that a host provides kai and rest for visitors. It’s common for hosts to treat guests with delicious food, often local delicacies, in an effort to ensure the guest remembers the experience with fondness and gratitude. The ultimate Whakarewarewa experience is discovering our culture, heritage and history through a guided tour, watching a live cultural performance, walking one of our beautiful nature trails then taking time to relax and tuck into our unique and delicious kai! 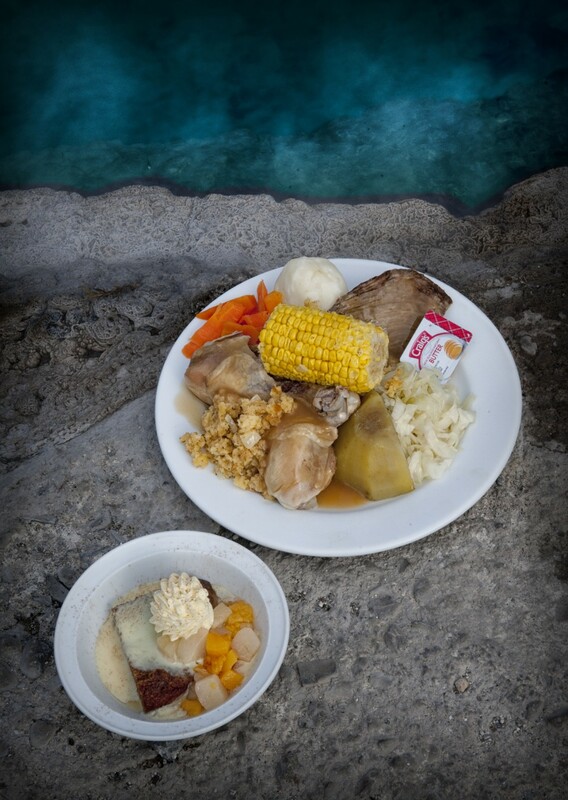 Sweetcorn on the cob, cooked in Parekohuru, our largest mineral pool. Mother Nature takes care of this cooking process: Eight minutes cooking time in our bubbling pool, produces the tastiest corn you’ll ever eat, packed full of natural goodness. Our Geothermal Hangi Meal is our ultimate feast. Cooked courtesy of our geothermal steam vents and hot springs, this meal comprises of chicken, beef, potato, kumara, bread stuffing, carrots, cabbage topped with gravy, with our delicious corn on the cob on the side. Dessert is our famous steam pudding, served with fruit salad, custard and cream. 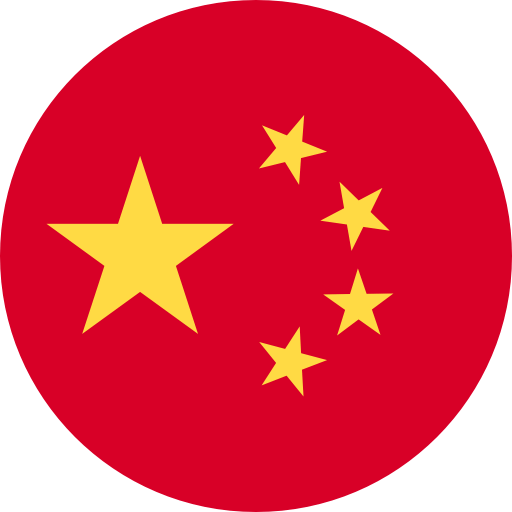 Tea, coffee and water are all complimentary. 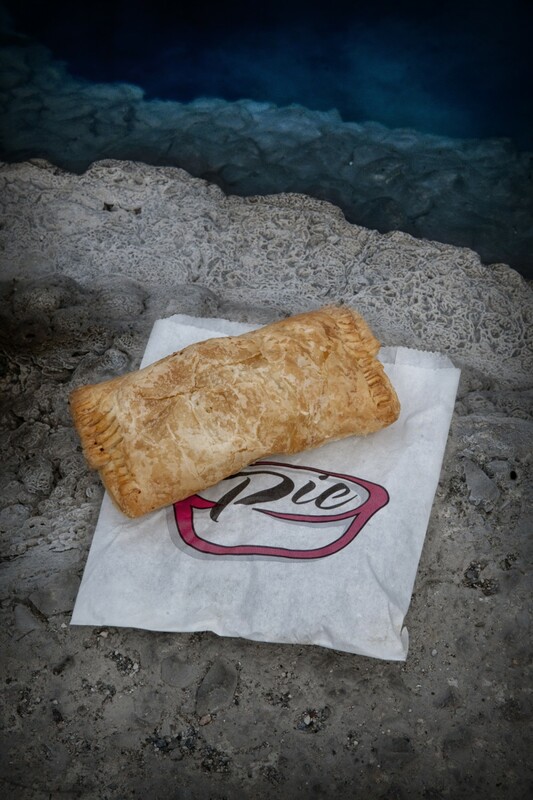 Our famous Hangi Pie: This consists of all of the ingredients in the geothermal hangi meal above, served wrapped within a golden puff pastry served with a side salad and corn on the cob. Dessert is our famous steam pudding, served with fruit salad, custard and cream. Tea, coffee and water are all complimentary. Experiencing our food for many is a once in a life time experience. To book, simply click book now and select your desired food package. Our food packages are popular, so we recommend booking these in advance to avoid disappointment. Living amongst the geothermal wonders of the Whakarewarewa Valley means our village residents have used this energy to cook with for hundreds of years. Māori traditional cooking uses a cooking technique called ‘hangi’, which loosely translates to ‘earth oven’. In traditional hangi cooking methods a hole is dug in the ground, and hot stones are placed at the bottom of the hole. The food is then placed on top – usually meat and root vegetables – before being covered with a cloth and a mound of earth, trapping the heat within the hole. 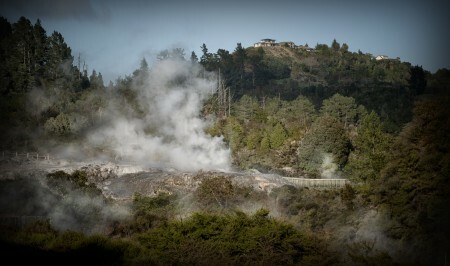 Here at Whakarewarewa Village we have a unique twist on traditional methods used for hangi. We don’t need to rely on hot stones: We can utilize Mother Nature’s hot steam from our geothermal steam boxes, as well as our mineral pools to cook our kai. Our mineral pool, Parekohuru, is the largest hot spring in our village, and today is used for cooking leaf and root vegetables, seafood and of course our corn on the cob. 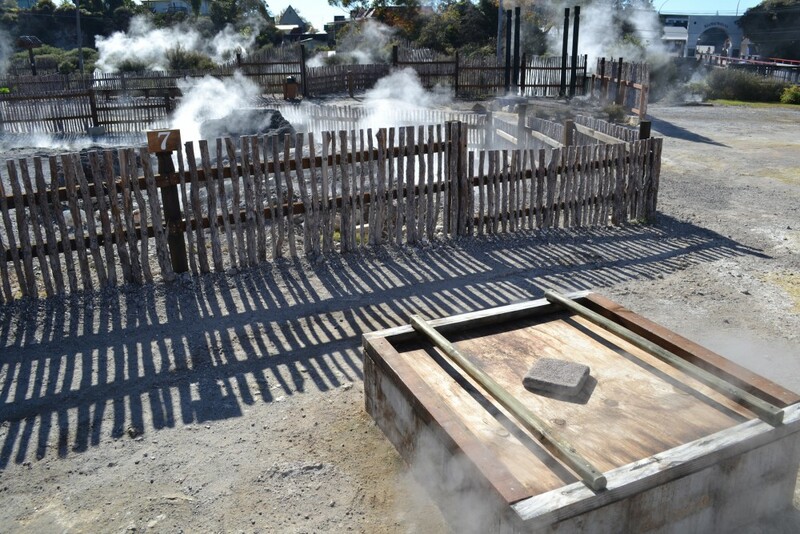 Sample food cooked in this hot spring when you purchase our delicious Geothermal Hangi Meal available in our café. For this popular dish, we recommend booking in advance to avoid disappointment. For cooking in our mineral pools, the food is placed in a muslin cloth, or a flax basket. This is then lowered into the pool for a certain amount of time. There’s nothing like savouring corn on the cob that has been cooked within a natural hot pool! Māori also cook using a cooking technique called the ‘hangi’, which loosely translates to ‘earth oven’. In traditional hangi cooking a hole is dug in the ground, and hot stones are placed at the bottom of the hole. The food is then placed on top – usually meat and root vegetables – before being covered with a cloth and a mound of earth, trapping the heat within the hole. Here in our Village we have a unique twist on traditional methods used for hangi. We don’t need to rely on hot stones: We utilize Mother Nature’s hot steam from our geothermal steam boxes to cook our kai. Here at Whakarewarewa, we also offer our ‘famous’ hangi pie. This consists of meat and vegetables, cooked using the hangi method above, then served wrapped within a pastry casing. The result is a delicious crispy, hearty flavour – truly one of a kind! Here at Whakarewarewa, we also offer our ‘famous’ hangi pie. This consists of meat and vegetables, cooked using the hangi method above, then served wrapped within a pastry casing. The result is meaty goodness with a delicious crispy finish. Our hangi pie is often referred to as a New Zealand ‘Must Do’ and it’s easy to see why: This is a truly one of a kind pie! 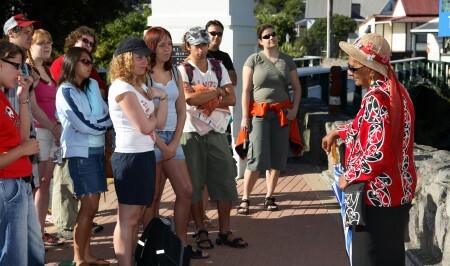 Explore the Living Māori Village of Whakarewarewa with the Guided Tour. Your local guide, a descendent of generations of guides from the region, will educate and delight you with stories of the Village and valley. 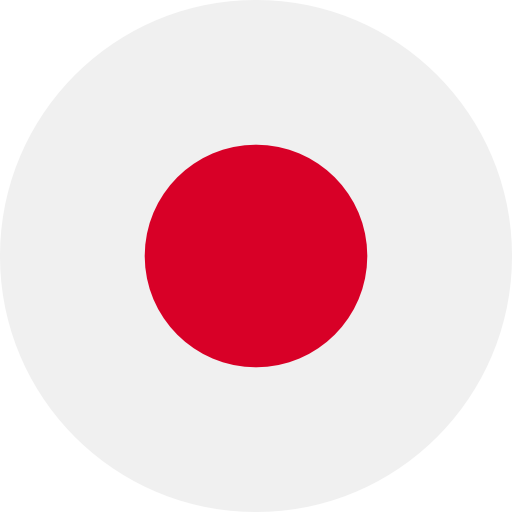 See how we use the natural geothermal energy for everyday use, and experience traditional dances and songs (including the legendary “Haka”) from our resident kapa haka group - Te Pakira. Our popular daily Cultural Performances pay tribute to the legacy of performing arts of our ancestors. Let us introduce you to kapa haka, our traditional performing arts. 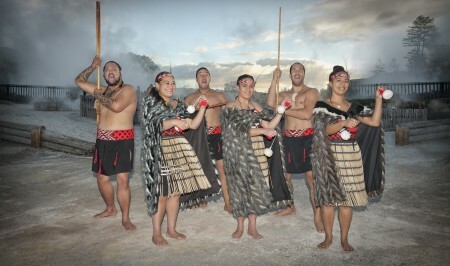 Each performance includes Waiata (songs) of our history, Patere (rhythmic chants), stick games, poi dancing, and the world-famous haka war challenge – all performed by one of Rotorua’s leading cultural performance groups.